I have spent much of this morning filling the house with the smell of warm gingerbread and am singing carols to myself while piping icing on everything in sight. In truth, I may have inhaled too much ginger. Though this recipe has little to do with the garden (if only we had the weather for proper ginger growing), these are Christmassy as hell and can be hung on a tree, so here they are, resplendent in their festive selves. Pre-heat your oven to 180C (170C in a fan oven). Tip all of your dry ingredients into a large bowl and put to one side. Over a low flame gently heat the butter, golden syrup and sugar in a pan, stirring until the sugar is dissolved and the mixture takes on a silky appearance. Pour into the dry ingredients and stir until you have a smooth, stiff and biscuity dough. (I usually abandon the spoon and dive in with my hands towards the end). Line a baking sheet with baking paper and lightly dust a clean surface with icing sugar. Cut the gingerbread dough in half, then roll out the first batch to a thickness of roughly ½ cm. 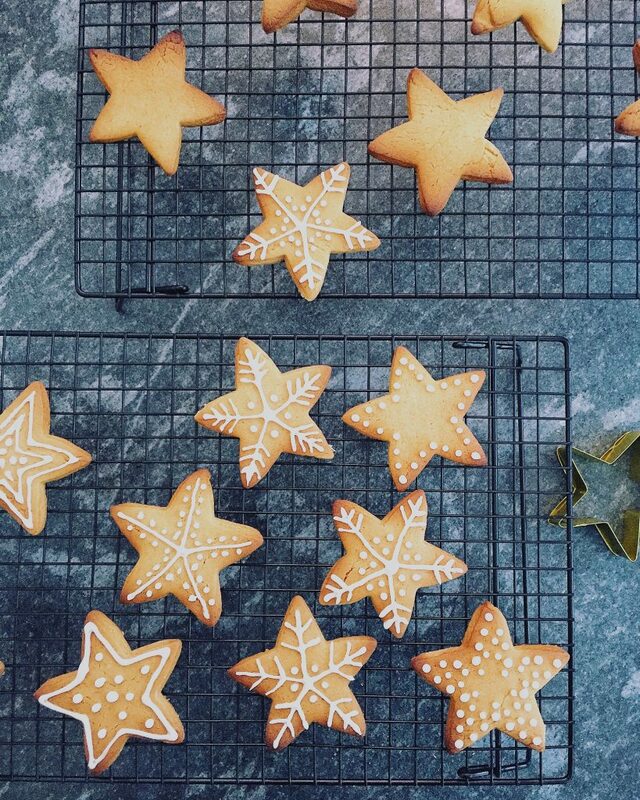 Carefully cut out a round of biscuits with your cookie cutter, placing them one by one on the lined baking sheet. Push the remaining dough together and lightly roll it again for a second round of cutting (I wouldn’t try a third time or the dough could become a little overworked). Then pop them all in the oven for 8-10 minutes, watching to make sure they don’t catch at the edges. Leave them to cool on the baking tray for a few minutes (now is the time to make holes in your biscuits if you’re going to hang them on the Christmas tree), then transfer them to a rack to cool completely before icing. To make the glacé icing, sift icing sugar into a bowl then carefully add the hot water, little by very little, stirring with a wooden spoon. You’re after a thick cream consistency. Spoon it into your piping bag, and then unleash your inner festive Jackson Pollock.